*I loved Raven Boys. I can't wait for the second installment. I'm hoping it's at BEA. I haven't read The Raven Boys yet, but I've heard it's really good! I really should get my hands on a copy soon... I love the cover for this one! I think it will be at BEA, according to the Publisher's Weekly article I read. I can't wait to get my hands on this one! I enjoyed The Raven Boys and I'm really curious to see what the sequel will bring :) Great pick! I definitely cannot wait to finally pick this one up! Really looking forward to this one, too!! The first book had kind of slow start for me, but I think now that the story is all set up, this second book is going to be awesome! I still need to read the first one! You are going to BEA! Awesome! Have fun! I cannot wait to find out what Ronan meant in that bloody last line of The Raven Boys. Which I think I should reread before this on... It will be interesting to see how the story develops especially since right now, I have no idea where it could lead. Nice! Haven't read The Raven Boys either. Seemed to have read mixed reviews. Not sure if I will venture that way yet. Still hope you enjoy this one though! I still need to read the first one but I love this cover. I need to read the first still. Hope you get to read it soon! I did this one today, too! I hope it'll be at BEA -- that's one I'd bite someone for. KIDDING! I SWEAR!! Haven't read The Raven Boys but those covers make me want to! They're amazing. Great pick. I've seen this one around a lot today! Maggie's hit or miss with me, but hopefully this one lives up to the hype! I still have to read Raven Boys but it looks great. I bought the Raven Boys but haven't read it yet. I'll have to give it a go. I loved The Raven Boys so much! I can't wait to read this one. More Ronan please! I really hope this one lives up to the hype. The Raven Boys was an okay read. I'm really excited about this one, too! I can't wait to find out more about Ronan! Every time Maggie tweets about it I get more excited! I'm listening to the first book on audio right now -- it's good! WOOHOO! Yes. I sooo WANT! Alison!!! we must get a copy at BEA and it's supposed to be there we just need to grab a copy! Loved Raven Boys so freaking much.! I'm so excited fro this one, too. I loved the Raven Boys and cannot wait to find out what happens next. I'll keep my fingers crossed that you're able to snag a copy at BEA. Have fun! SO excited for this one!! I absolutely loved The Raven Boys, and I can only imagine how much more crazy and awesome this 2nd volume will be. We haven't had a chance to read The Raven Boys yet but we love Maggie Stiefvater! Nice choice! Of course! This will be fabulous, your right on the money. Great pick. I haven't read the first one in the series yet (but I have it!). I'm really going to have to do that soon, I've heard great things! And that cover is fabulous. I can't believe I haven't gotten to The Raven Boys yet, despite having picked it up ON RELEASE DAY last year. Le sigh. Plus, Maggie Stiefvater is one of my alltime favorites so I really have no excuses. In the meantime, despite not yet having read the first book, I'm super geeked about The Dream Thieves, too. Just can't help myself! Great pick! Ohh I like the cover! I haven't read the first book, yet...maybe soon :) Great pick! 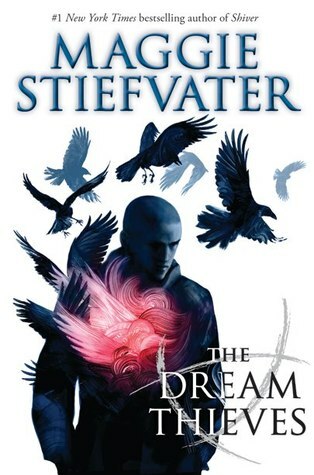 I love the magic in this series, and I was absolutely blown away by how great of a sequel The Dream Thieves is compared to The Raven Boys as an introduction to The Raven Cycle. Maggie Stiefvater's writing is magical in and of itself, but the world she created here is incredibly intoxicating!